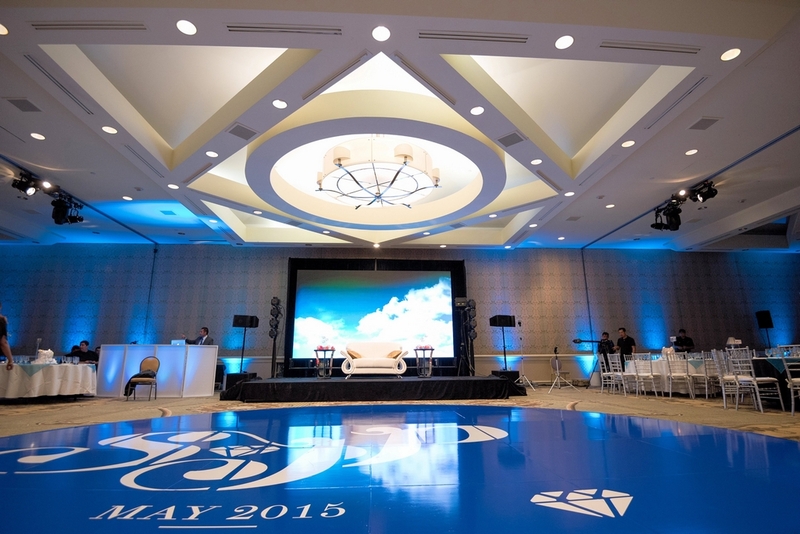 What did you like about the Hilton Long Beach? How flexible they were and how special they made us feel. Plus we loved the space. Our catering manager, Joe D’Aprile was fantastic! 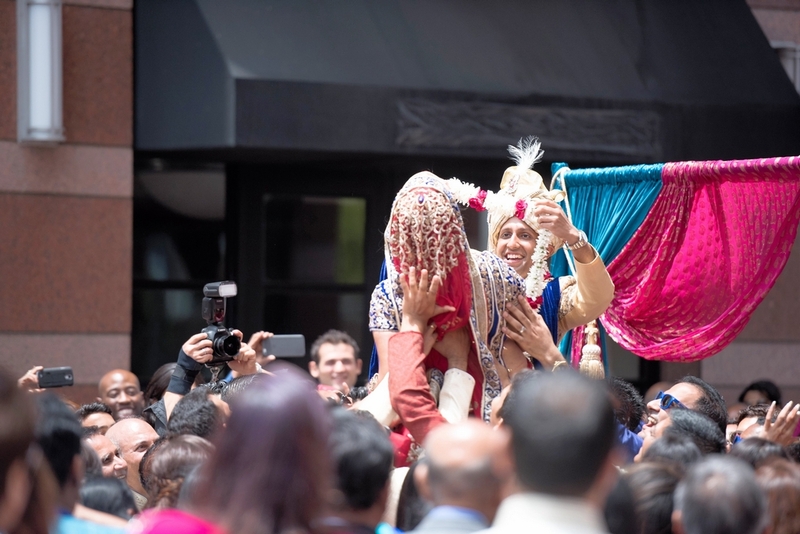 He was attentive, knowledgeable about Indian weddings, and accommodating of our requests – as we had a lot going on – in terms of decor and entertainment. 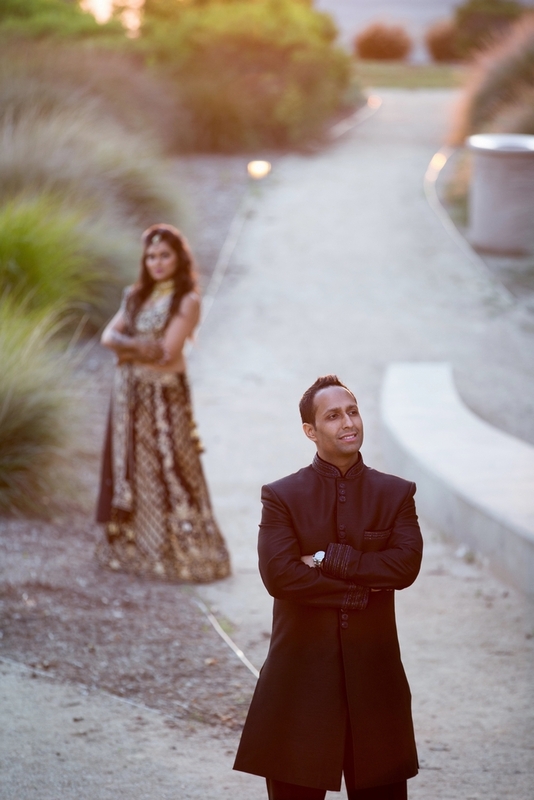 Ours was the last wedding in their ballroom before their renovations started; so we were able to do things that usually aren’t allowed – like hanging photos of Sahil and I on the walls. 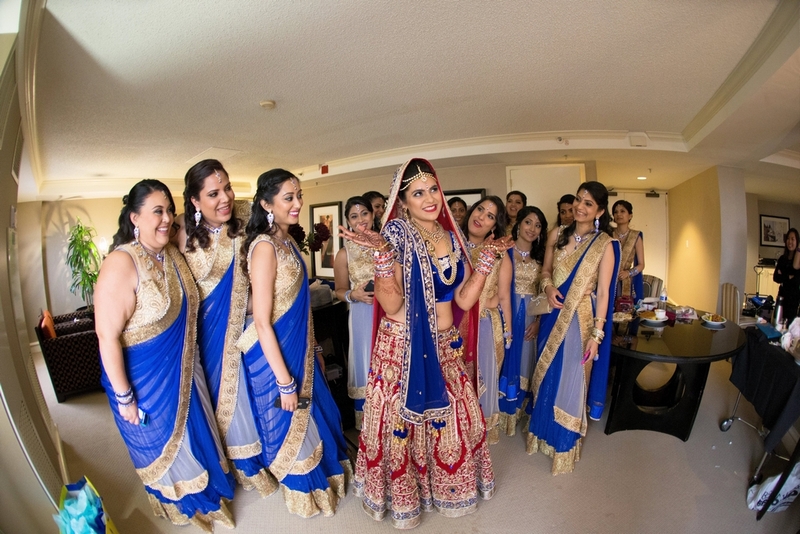 When we walked into the Hilton Long Beach, a few days after our wedding, any staff member we came across greeted us with such familiarity. Everyone knew who we were and made us feel incredibly welcome. After the wedding, we wrote a letter to the General Manager of the Hilton Long Beach expressing how happy we were with our experience and how wonderful it was to work with our Catering Sales Manager, Joe D’Aprile. They were so touched! How far in advance did you book the venue? About 1.5 years before the wedding. We knew we wanted to go big – and that it would take time to plan, so we gave ourselves plenty of time. What were you looking for in a venue? 2. 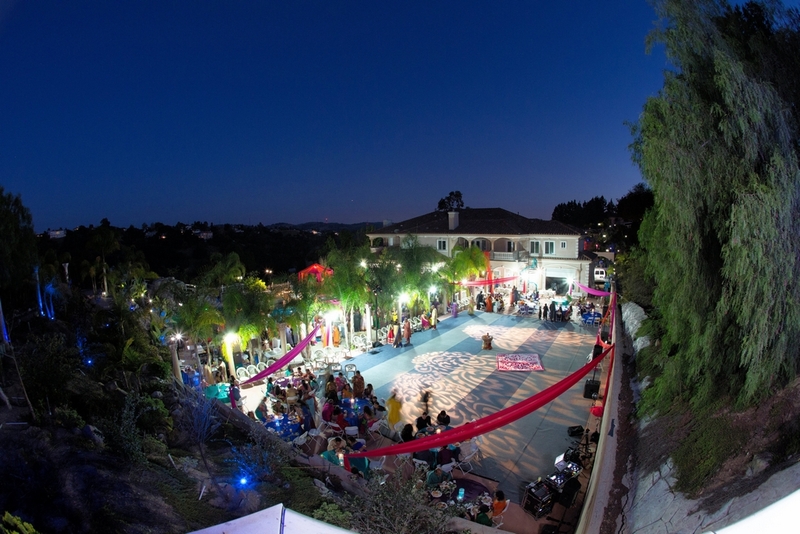 A property that wasn’t so huge that it would take all 600 of our guests a long time to walk from one area to another. We were on a pretty tight schedule and didn’t want delays because of moving our guests from one space to the next. 3. Something flat vs. hilly. 4. A venue with a self parking option. With that many guests, a venue with valet-only would have taken too long for our guests, just to park and delay our events. 5. 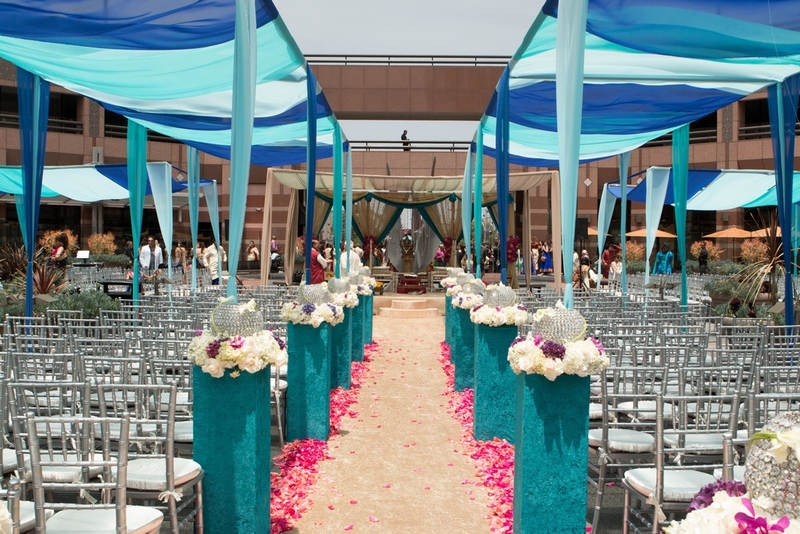 A venue that had experience with Indian weddings. The Hilton Long Beach had everything we wanted! What were some of the decor and entertainment items on your wedding day? The way the Hilton Long Beach is set up, you go up an escalator to get to the ballroom. 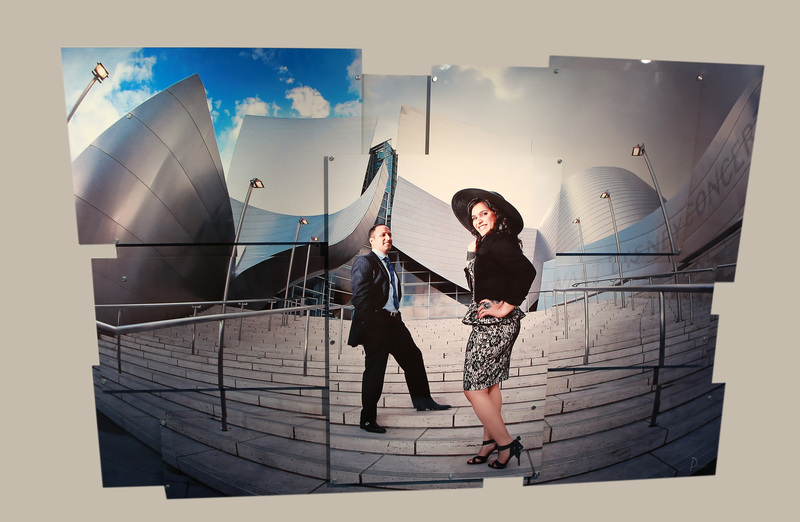 In the foyer (space just outside the ballroom) are four pillars where we hung banners of Sahil and I. So as our guests approached, on the escalator, they saw the banners. Over the years Sahil and I have collected photos and other memorabilia, which we displayed on tables as well. We enlarged photos of us, which were hung on the walls. We had the photos cut into unique shapes, framed them, and the Hilton allowed us to drill the picture frames into the ballroom walls. Sahil and I both love to party and Vegas. 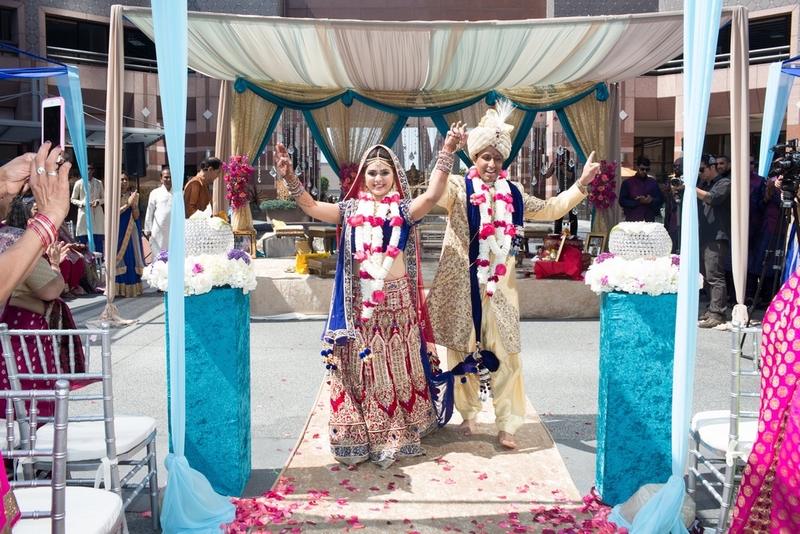 We wanted to bring Vegas to LA for our reception; and we wanted the whole affair to be very unique. 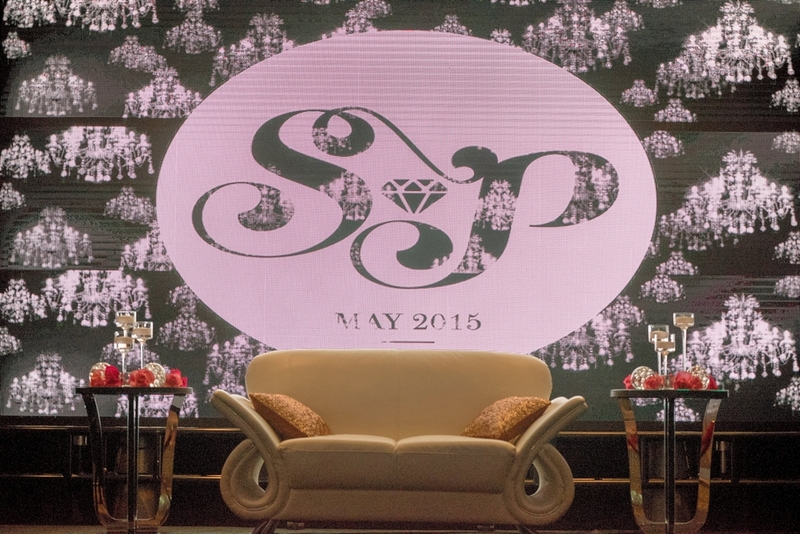 Through decor, special effects, and lighting, we created a club-like atmosphere. 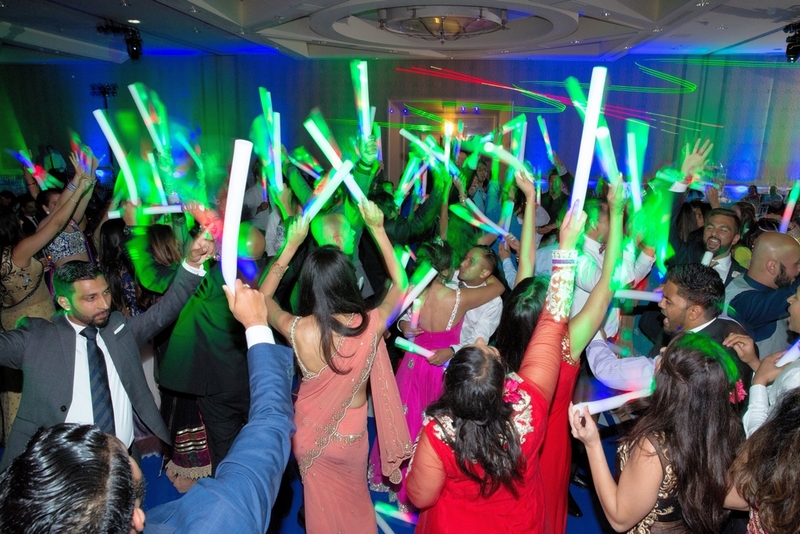 We had CO2 cannons, lots of crazy lighting, distributed glow sticks and a 16 ftx9 ft. screen was the background of our sweetheart table. Throughout the night, photos, videos, and graphics were playing/flashing/rotating all night. We had 3 different DJ’s – each did sets throughout the night. 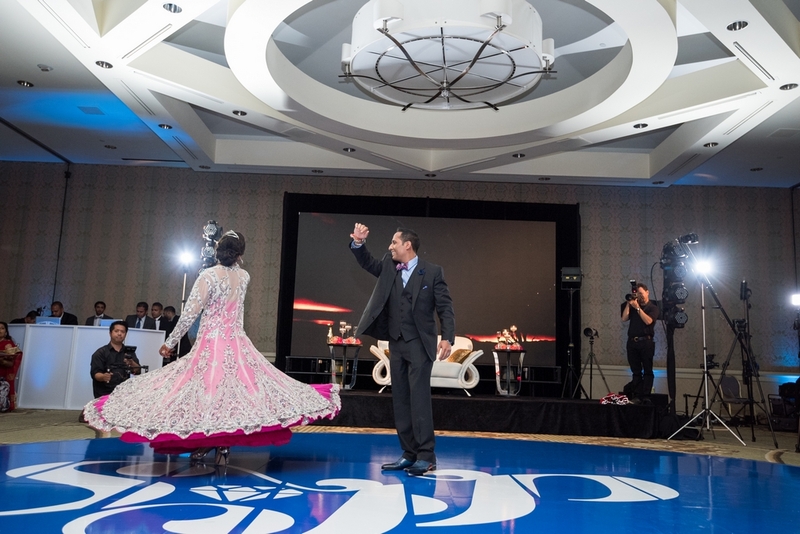 We both love the color blue, so we got a round, blue dance floor. Our first dance was a compilation of 3 different songs. When the song lyric was “heart”, hearts popped up on the huge 16 ft.x9 ft.screen. 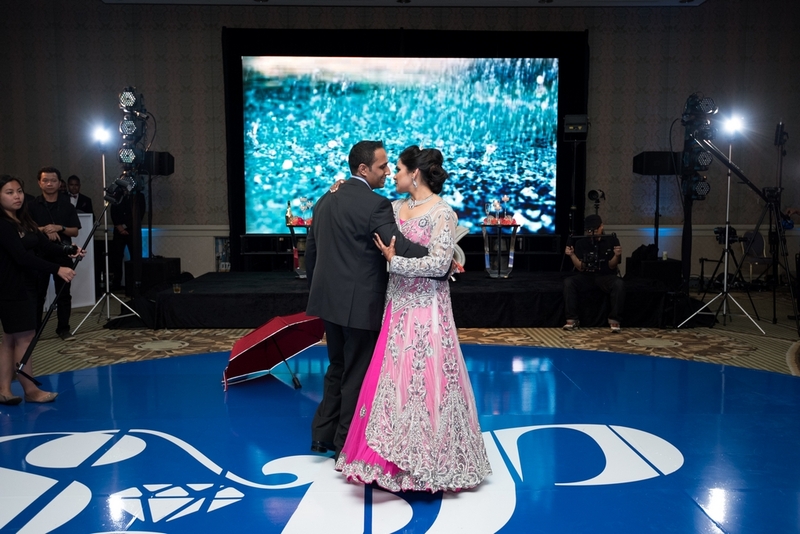 At one point during the dance, Sahil opened an umbrella and there was rain on the screen, and the last song of our dance was represented us traveling around the world, so the screen showed different monuments and scenes from around the world. 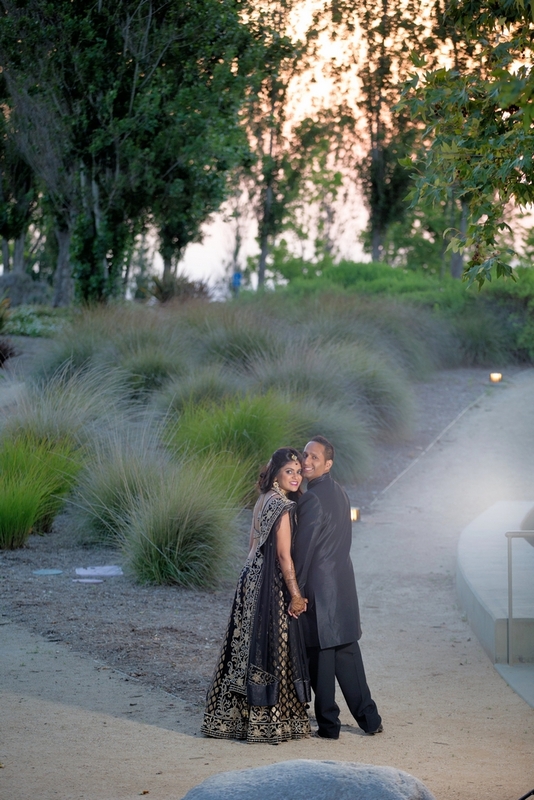 You can see rain on the screen in behind Payal and Sahil. 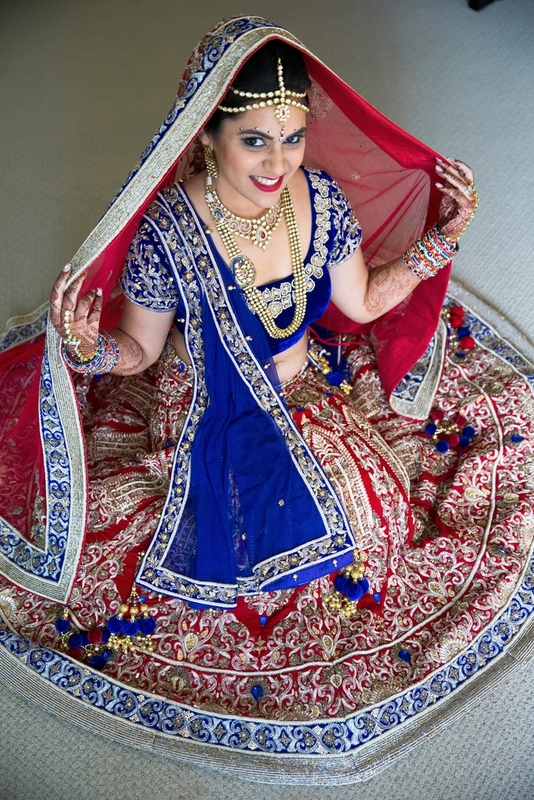 Tell us about your sangeet. 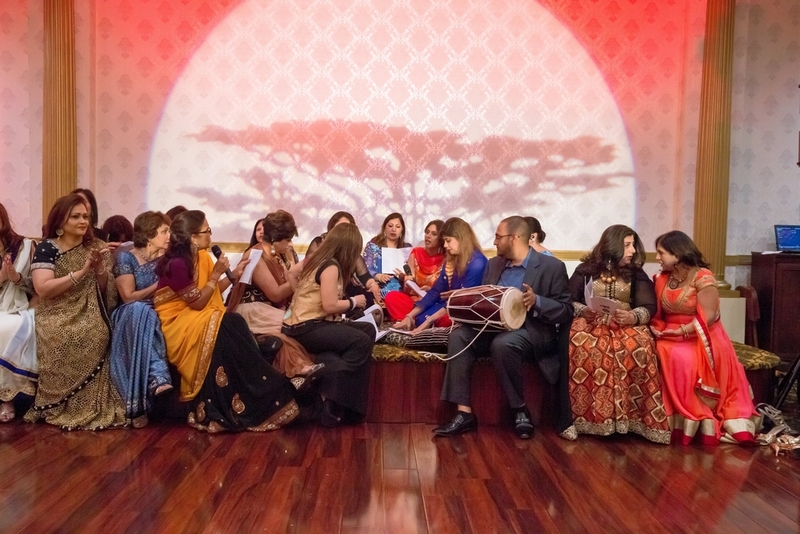 Sahil was born and raised in Africa so we made our sangeet theme “Out of Africa”. My mother-in-law was in charge of the decor. We got gobos of giraffes, elephants, and other animals lighting the walls. 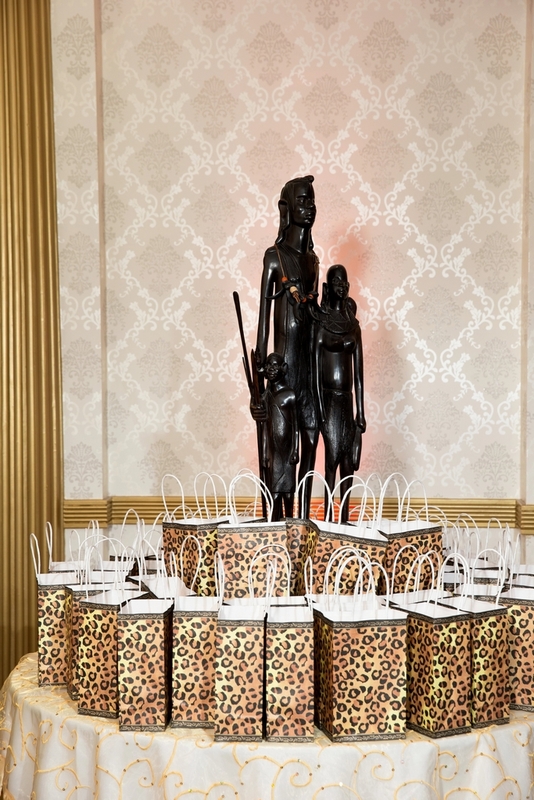 The men were given animal print scarves and African decor was placed all around Diamond Palace restaurant. I wore a black outfit with gold work. All of the colors that night were firey and bright. 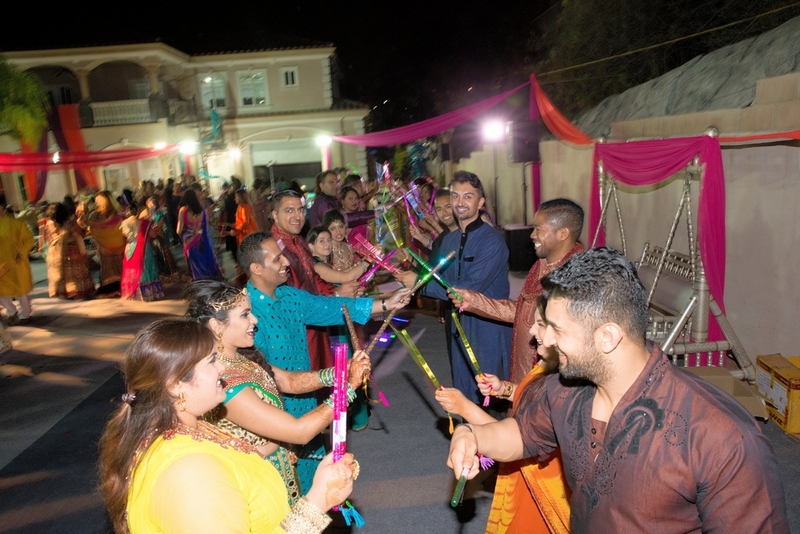 How did you setup your garba? 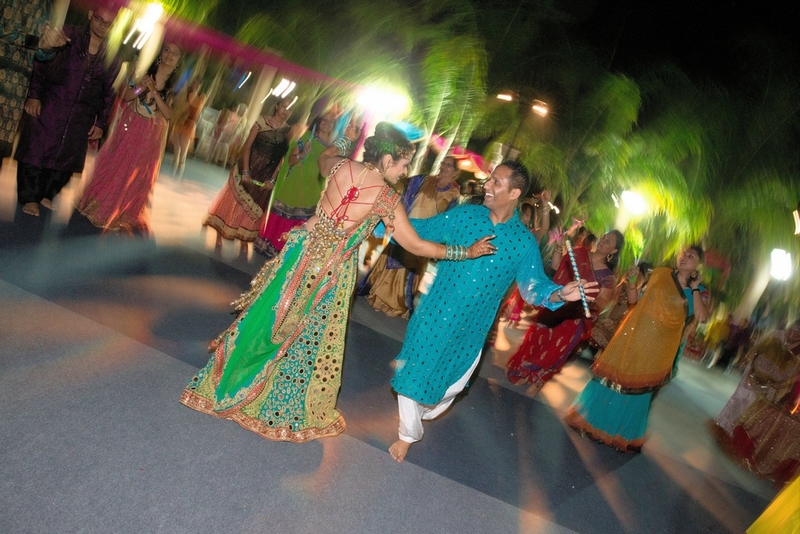 The garba was very traditional. 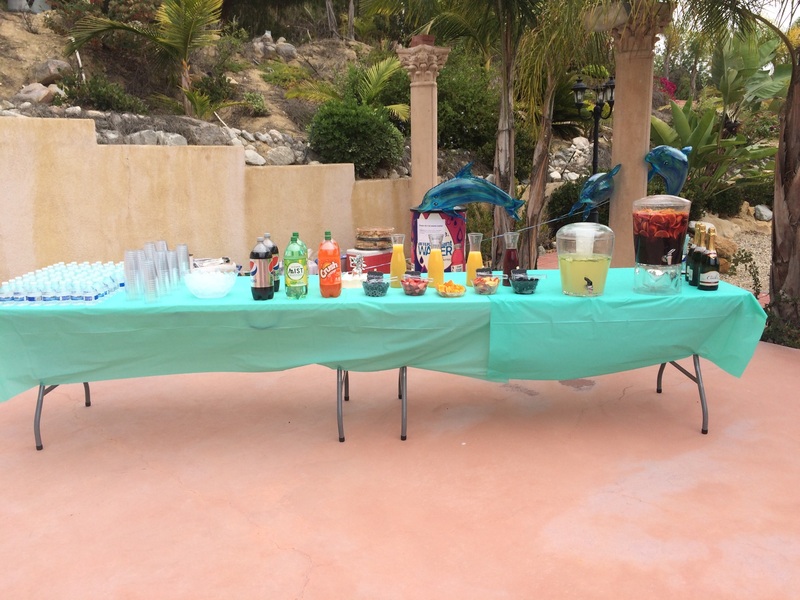 Kumba did all of the decor that night. You spent about a year designing and working on the clothes. Share more about that. My in-laws own Dreams Collections. 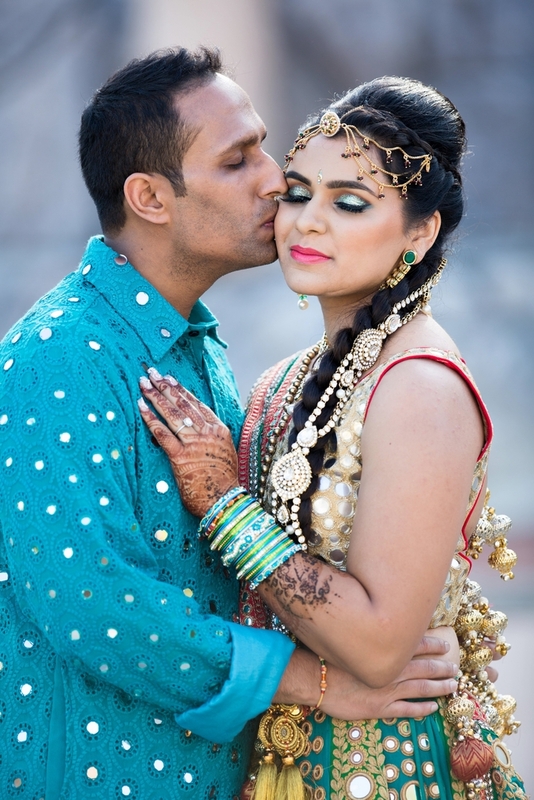 Many couples shop there, as their clothes are beautiful quality pieces and the latest fashion. 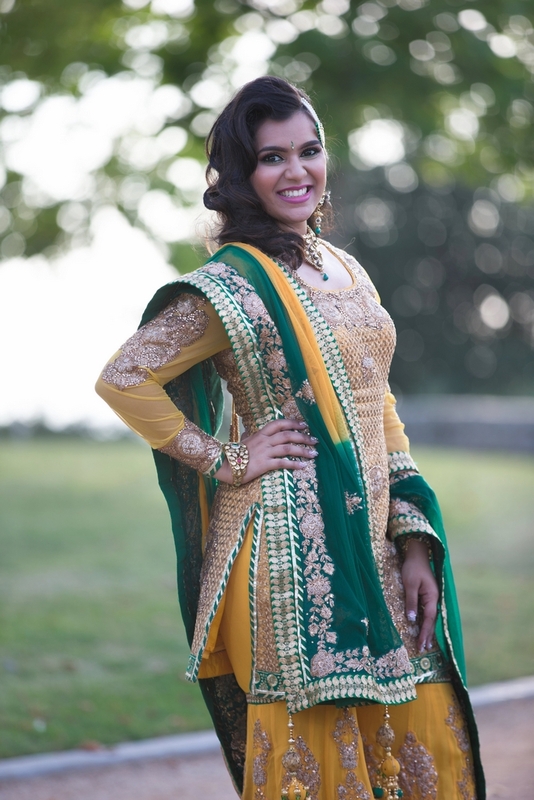 The owner, Sakshi Dosaj, is absolutely wonderful at customizing and altering things to fit the individual. 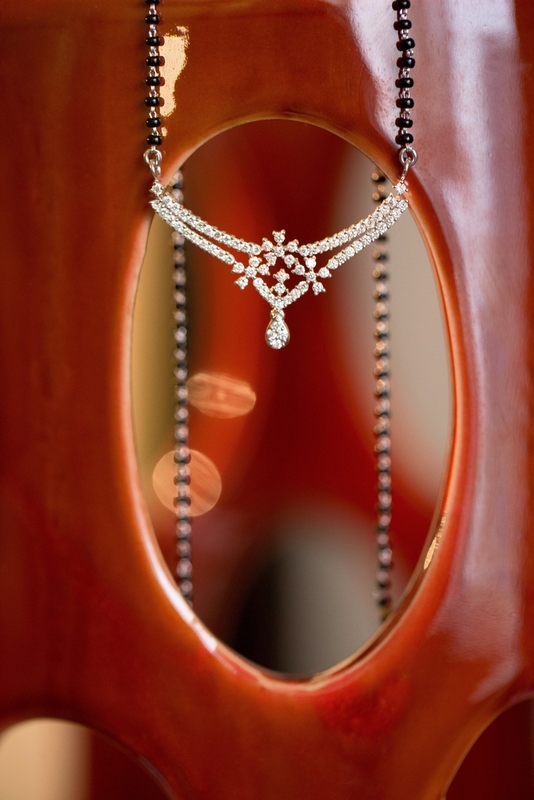 Her personal attention and commitment to produce pieces that her clients are happy with sets her apart. 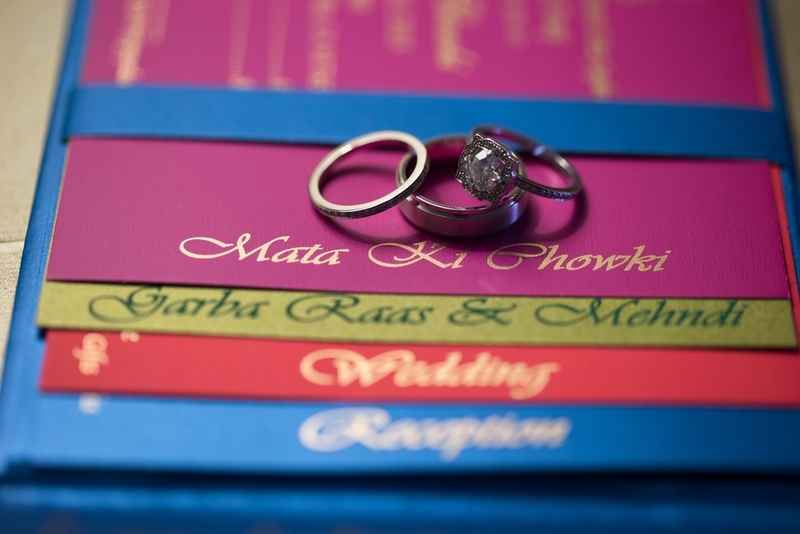 I worked closely with my mother-in-law to prepare everything. 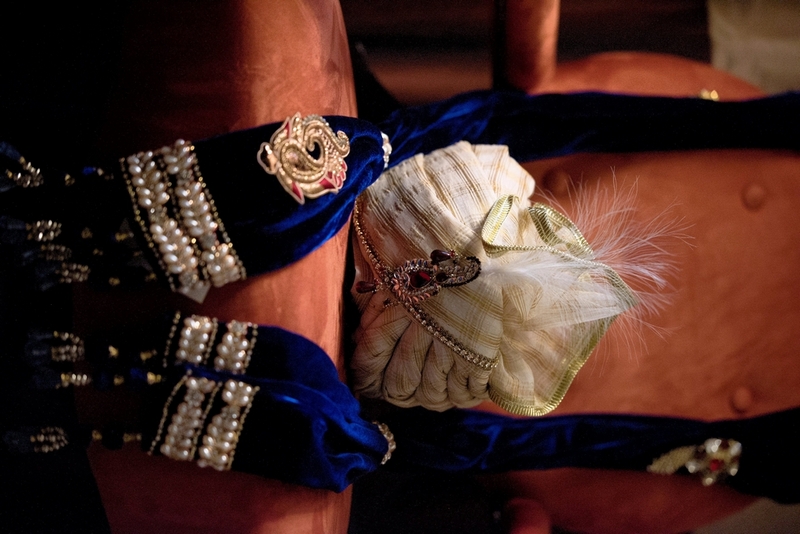 Throughout the week I wore a variety of headpieces – tikkas, jhoomars – and different looks for each day. 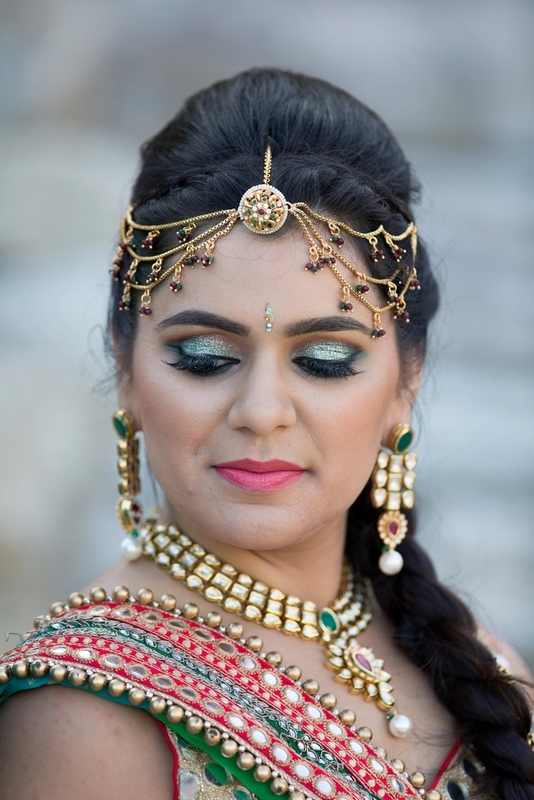 I did a Pakistani look one day with a jhoomar. One day I wore my hair in a braid so I had a jewelry piece that covered the entire front of it. 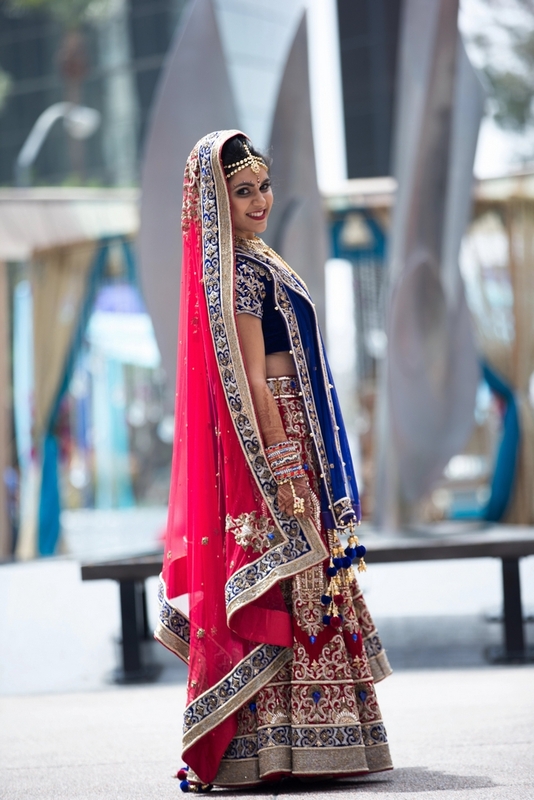 Blue is one of my favorite colors which I wore at our engagement. Red at the ceremony. I went non-traditional too. 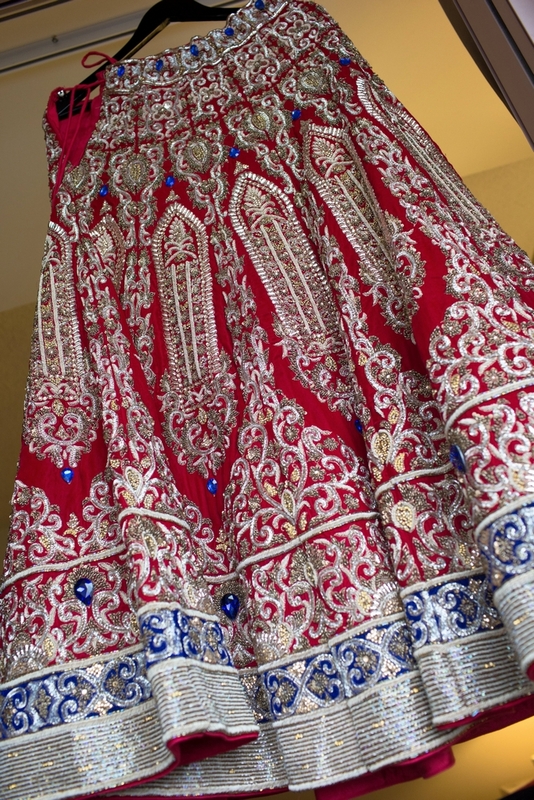 My blouse was blue and the skirt and dupatta were bright red with a blue border. I had 2 dupattas, one that was blue that I wore around me and the red one with a blue border to cover my head. Pink at the reception. I created a gown-jacket look. The jacket has long sleeves with Swarovski crystals. it and wore the gown the rest of the night. 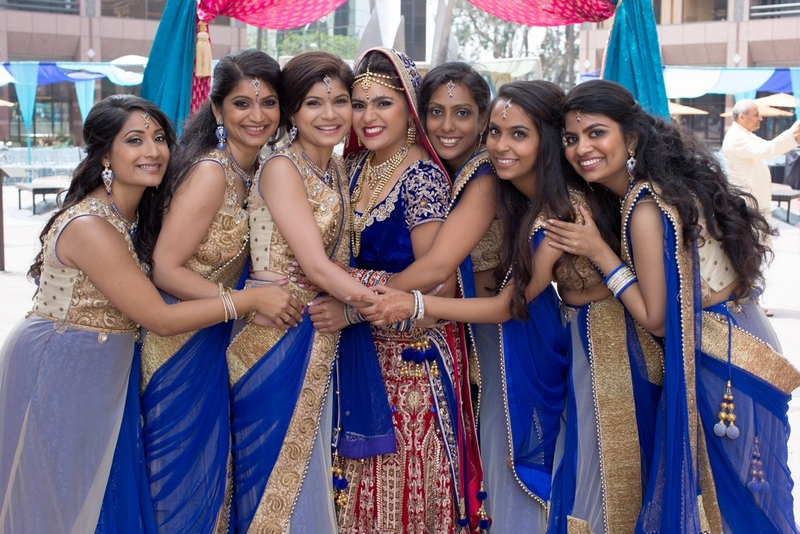 We also color coordinated the clothes for our families, extended families, and bridal party. 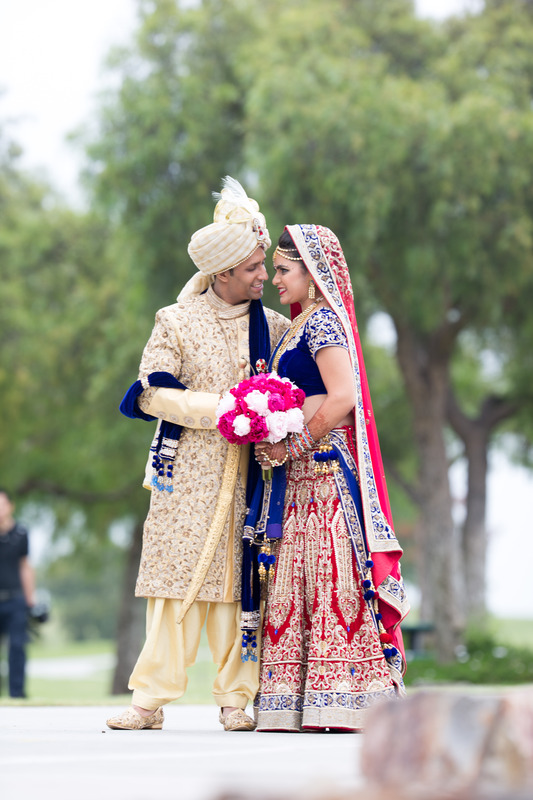 Color coordination makes a big difference in how everything looks – especially while engaging in traditions like milni and carrying me down the aisle. 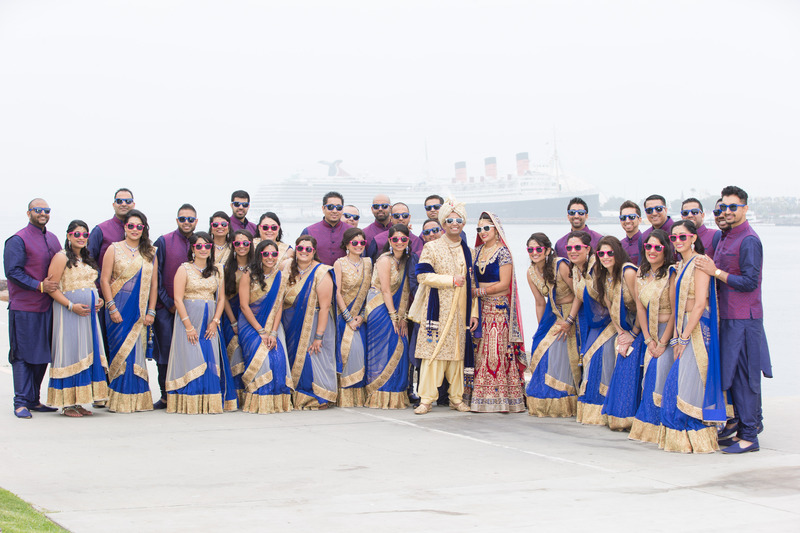 We gave our bridal party matching sunglasses. Boys had blue, girls pink, Sahil and I – white. The groomsmen had their name on one side and “groomsman” inscripted on other side. 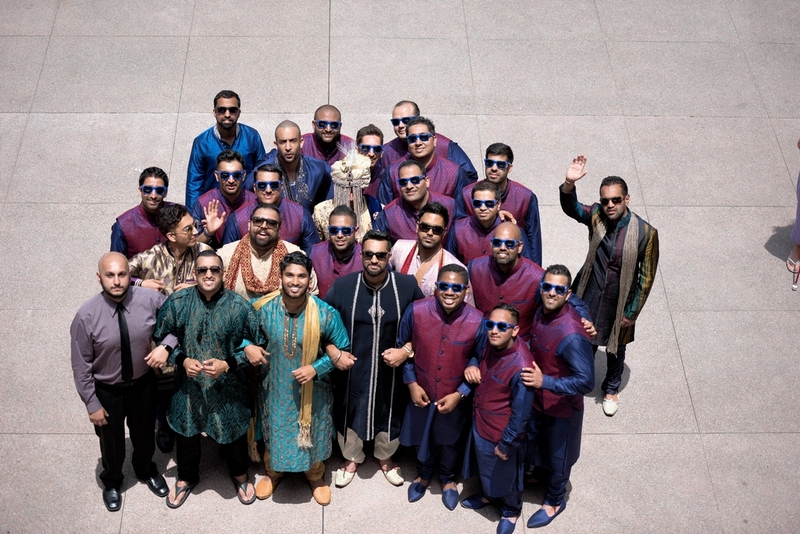 Bridesmaids had their names and “bridesmaids”; and my and Sahil’s glasses said bride/Payal and groom/Sahil respectively. 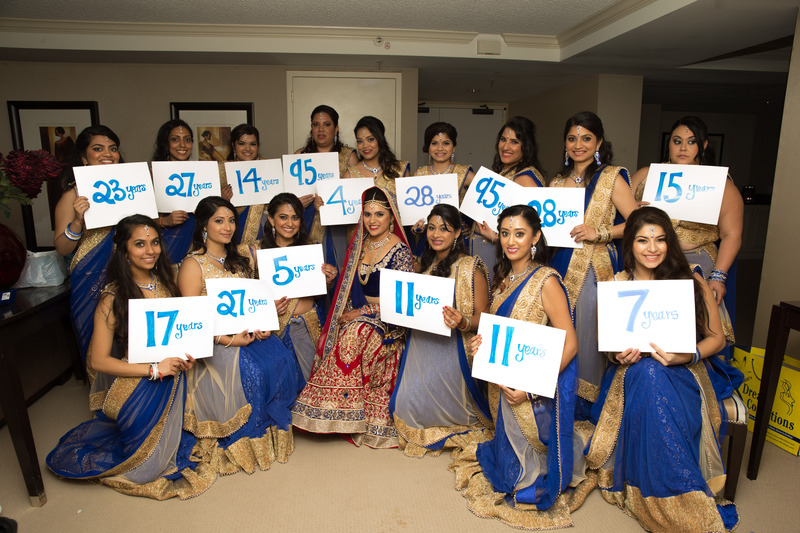 Since I’ve known most of my bridesmaids for pretty much all of my life, one of them made signs illustrating how many years each bridesmaid has known me! The ones that say “95” are actually 9.5. Unfortunately the decimals in the middle aren’t visible. 😒 but I loved this idea! Pink – for the ladies on my side. 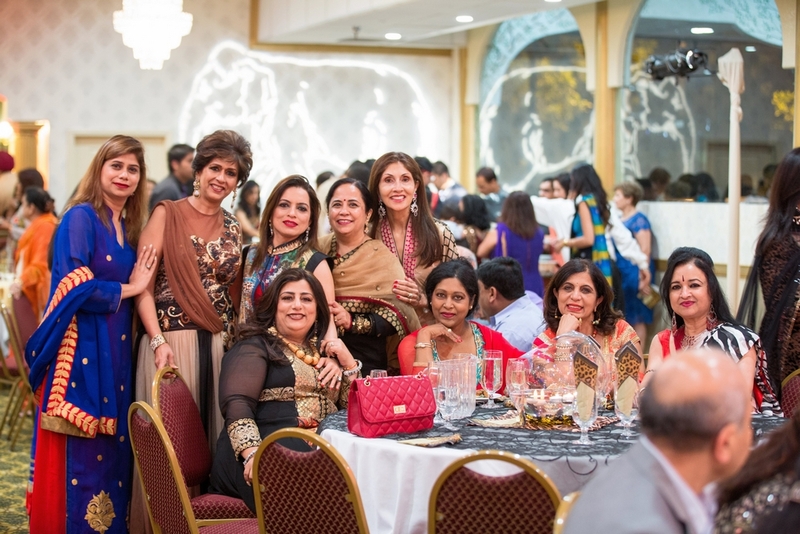 They all got/wore their own saris. Blue–for my brothers. 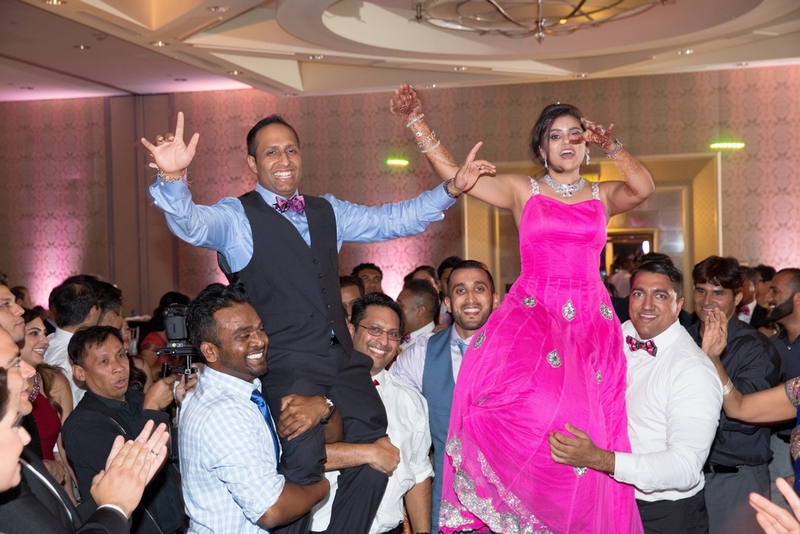 I wanted my brothers to wear matching outfits as they carried me down the aisle in a doli. 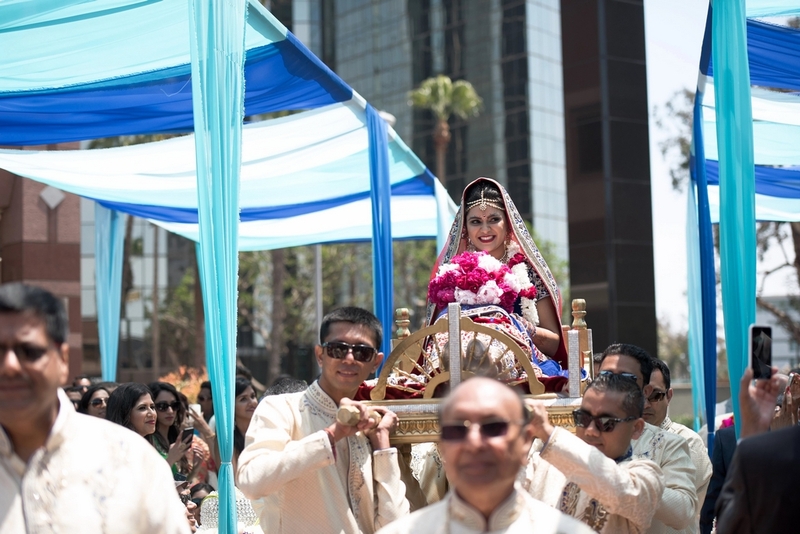 My uncle custom made it, as I wasn’t a big fan of any of the doli’s available for rent. 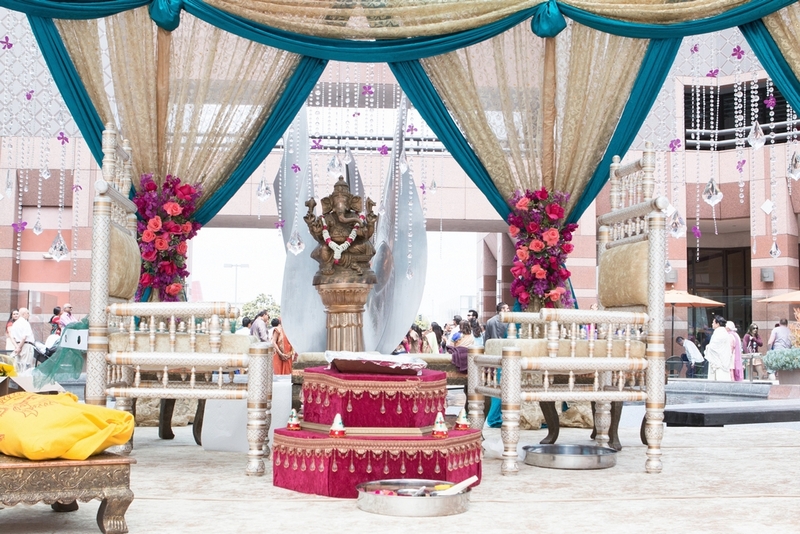 So my uncle created something just for me – an open doli with a lot of bling. I wanted something open that my brothers could carry, with antique gold and sparkles. I loved it! 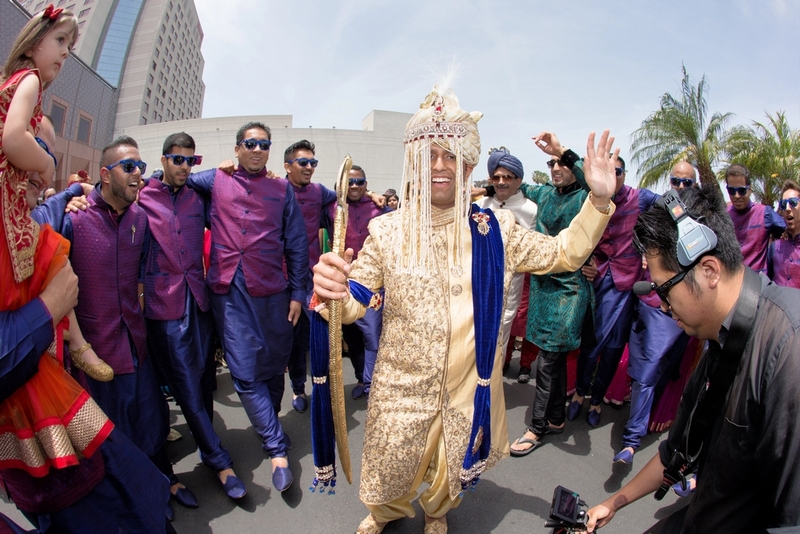 Sahil’s uncles wore blue pagadis (turbans). 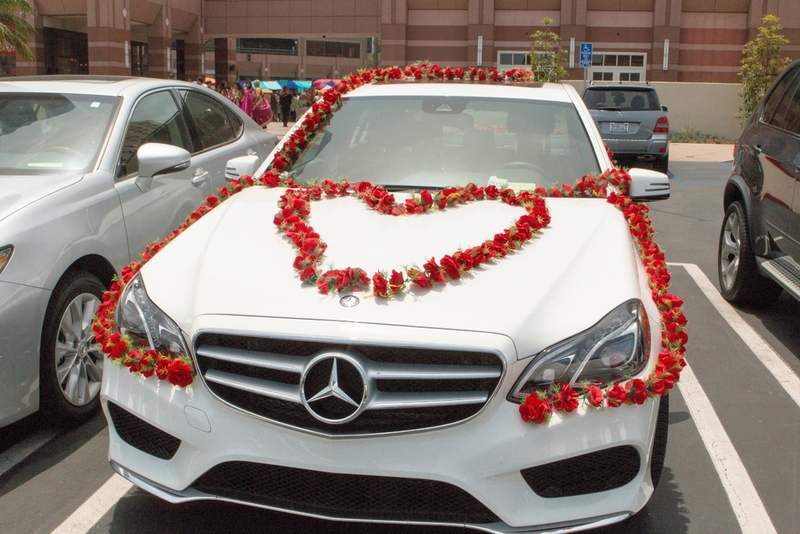 What were your wedding events? 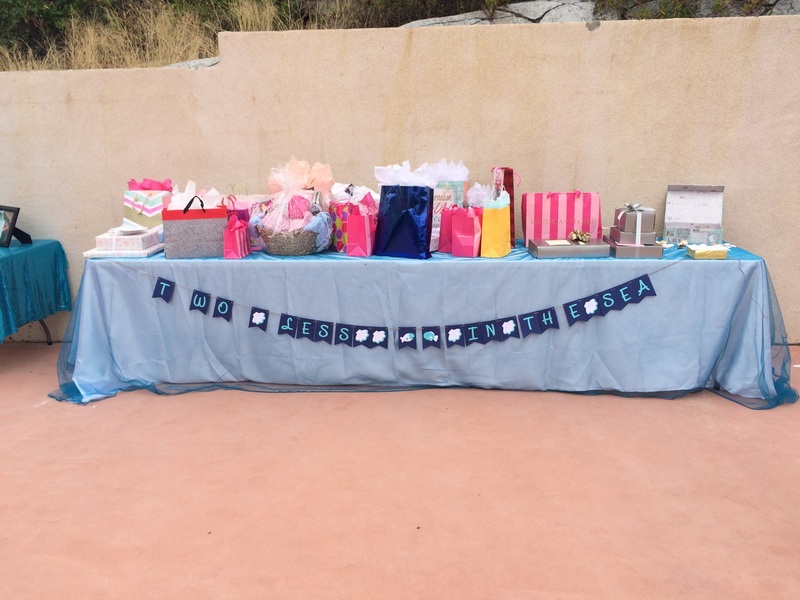 The bridal shower, with about 85 women, was held at my aunt’s house and co-organized by one of my bridesmaids that I’ve known for 14 years. Yes, Under the Sea. 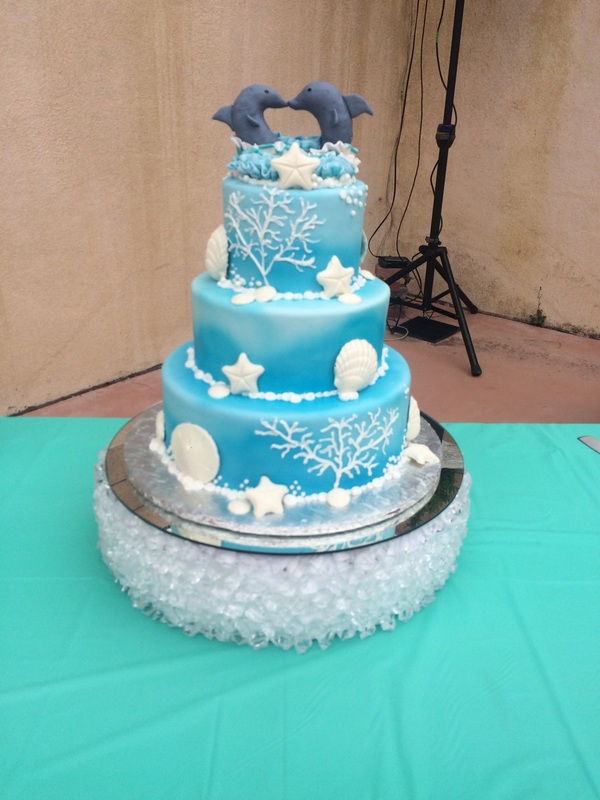 I love dolphins and wanted them incorporated into my wedding somehow so the bridal shower was the perfect event. 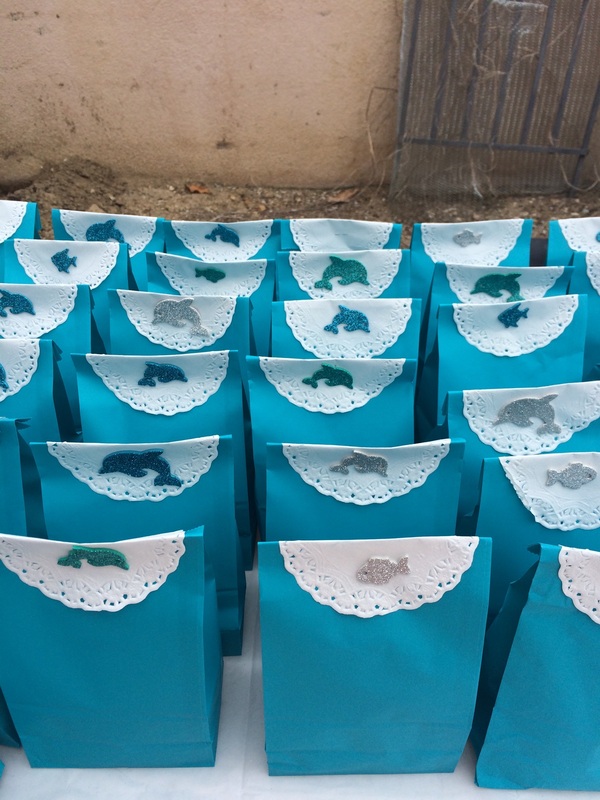 Everyone wore light colored dresses, the cake had dolphins on it, the centerpieces were all clams or seashells. We had seashell necklaces for everyone to wear. 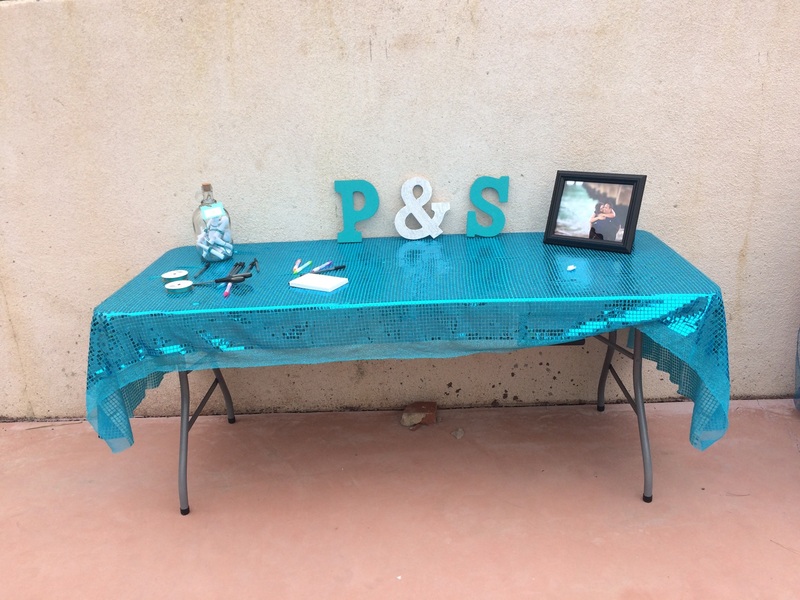 Did you hire a decorator for the bridal shower? 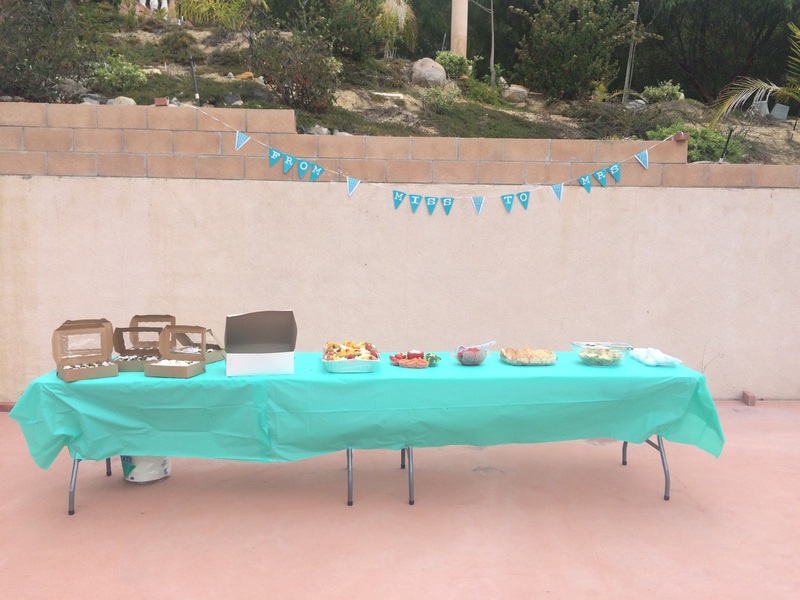 No, it was all organized by my friends. How did you make arrangements to seat 85 people in your aunt’s home? She entertains often so she had round tables and chairs.We served Indian food throughout much of the wedding week so for the bridal shower we had sandwiches and Italian. We had an event everyday that week. 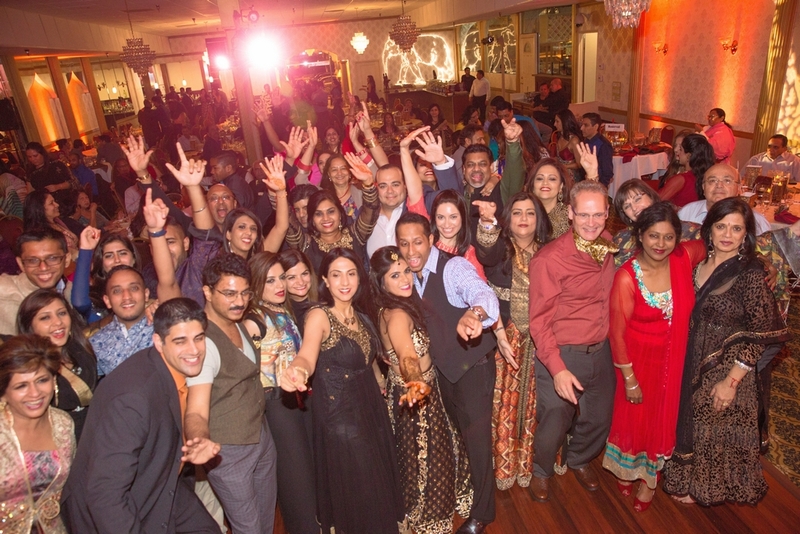 Monday: We did jago at Aroma restaurant in Upland. Friday:was dinner for family, close friends and out of town guests. 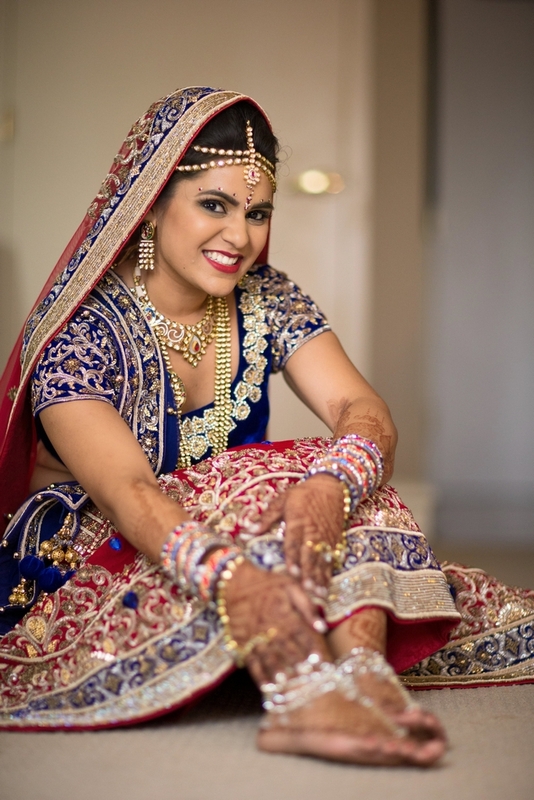 When did you do your mehndi? Wednesday morning and I got it done by Lishma Patel. You mentioned a tight schedule on the wedding day. What was the schedule? 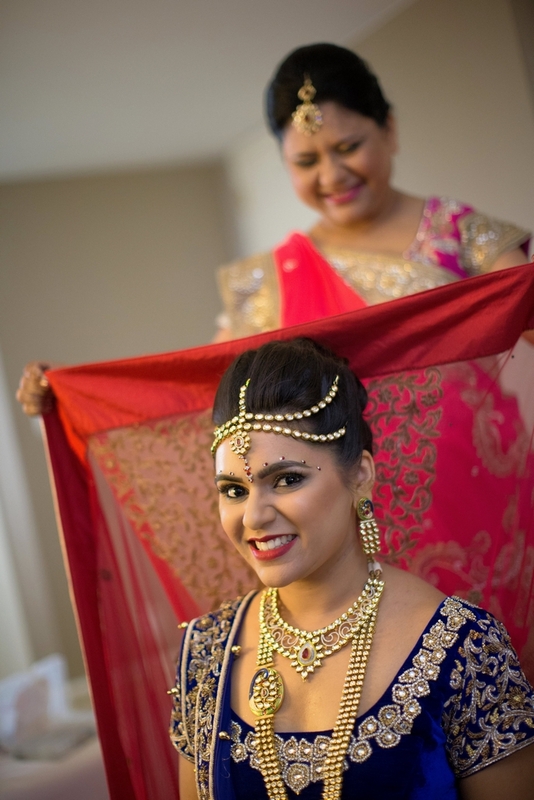 On the wedding day, Lishma started to get me ready at 4:30 am! As per Gujarati tradition, I came out at that point and Sahil and I exchanged jaimala’s. We after-partied at the hotel until 6am. The caterer boxed the leftover food for us and we kept the celebration going all night! The day after the wedding we went to Sahil’s parents house and played the ring game and among other games. That afternoon, my brothers picked me up and took me to my parent’s house where I spent time with my family and had dinner with them. It was pretty emotional when I left my parent’s house. My mom was emotional and many of my relatives from around the world were heading to the airport too. What was it like managing all of this, without a planner? For us, planning the wedding was not stressful. We were organized, gave ourselves time and didn’t argue. It helped that Sahil and I were on the same page about most things. On Sunday, the day after, we woke up and said, “let’s do it again”. 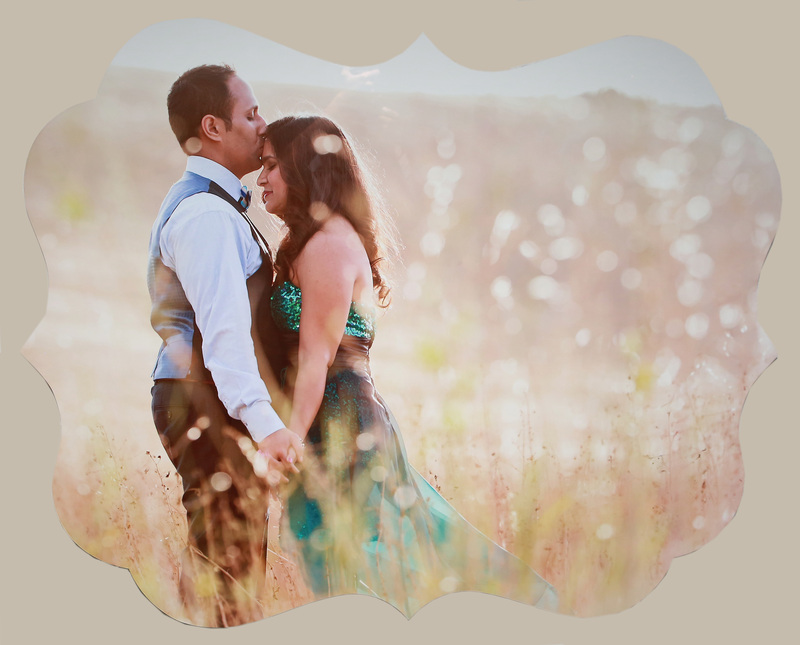 Also, we wanted to make sure that the week of the wedding we enjoyed and spent time with our family and friends. At that point we knew that if something went wrong there wasn’t much we could do about it so we might as well enjoy it! 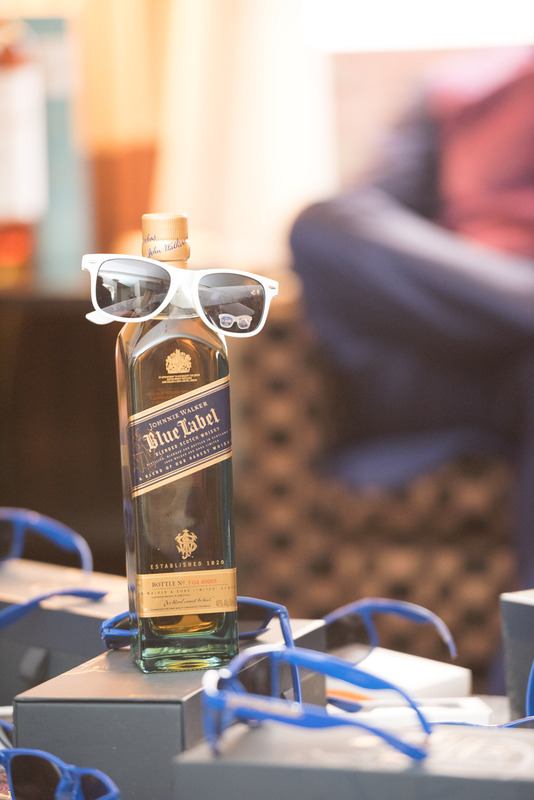 Our Wedding Professionals: We really let all of our vendors ‘do their thing’. We gave them a sense of what we wanted and didn’t want, and let them take it from there. 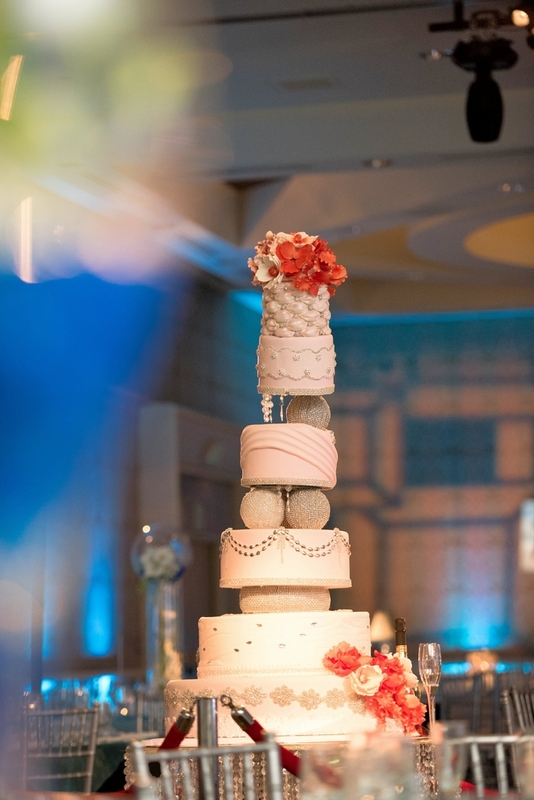 We had a centerpiece cake that was 7 feet tall displayed on a 2 foot glass table with diamonds on it. Day-of Coordinator: Planned by Pari; I went to college with her. 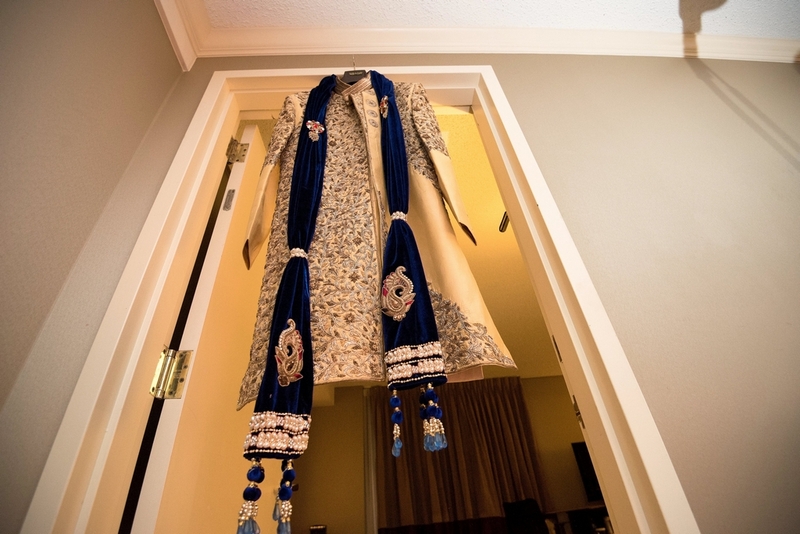 Dolled up by Lulu for the Mata ki Chowki, all of the bridesmaids and family members too. 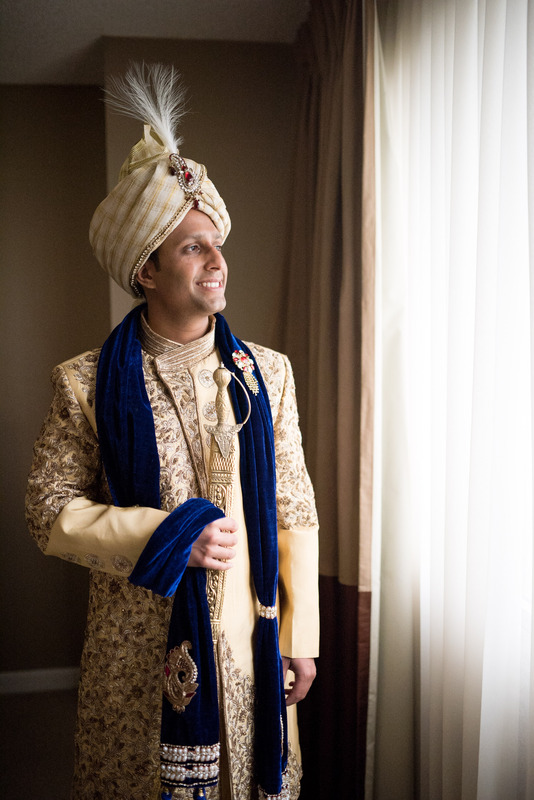 Amit Kotecha was a groomsman but he still did all the setup. 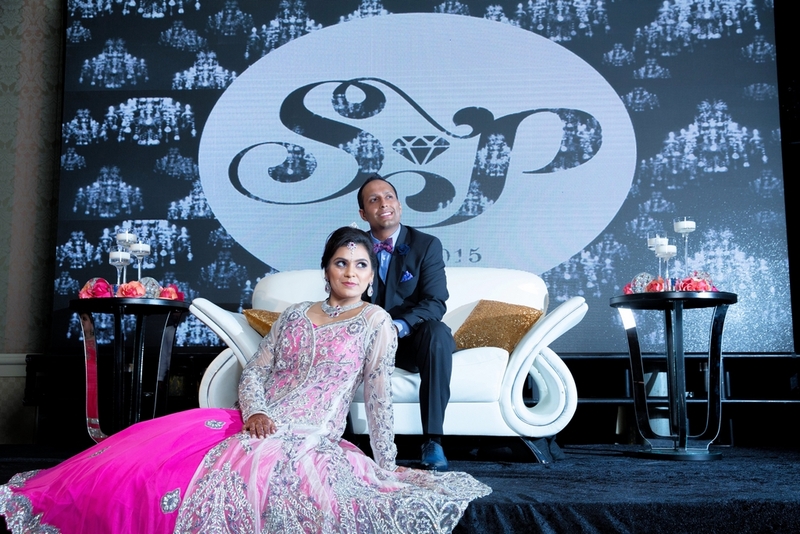 We wanted him to enjoy the party so we asked our friend Raj from Sound Nation to DJ at the wedding and reception. Sahil’s brother, Rohan, DJ’s with Amit so throughout the night Raj, Amit and Rohan each did their own sets. Round, blue dance floor, chiavari chairs and the canopies over the guest chairs during the ceremony to protect our guests from the sun.